Super Hero Boy: Oooo.. Its almost Halloween. Connor's recent obsession with pumpkins, monsters, and ghosts means one thing and one thing only. It's almost Halloween!! Actually I was totally dumbstruck with his recent pumpkin addiction not to mention the fact that he kept telling me he wanted to "eat" the pumpkins as I'm fairly sure he's never actually had a pumpkin pie... though his favorite baby food was by far pumpkin (yes pumpkin). Until that is I realized that every night he has been watching Hit Entertainment's new release Trick or Treat Tales pretty much non stop. Included on Trick or Treat Tales is six awesome Halloween themed episodes from all your favorite Hit Entertainment crew. Thomas in a super spooky, ok spook at least for Thomas, Halloween episode in which Thomas has to go on a last minute late night Halloween run for Sir Topham Hat. Barney and his friends planning an awesome Halloween celebration. Not to mention the whole episode that I'm fairly positive that started Connor's pumpkin obsession, Bob the Builder in Trix's Pumpkin Pie. You can also catch Fifi, Angelina, and Fireman Sam in "Halloween" type episodes. We always enjoy a bonus Fireman Sam episode so it was great to see the extra to include one by our favorite fireman. 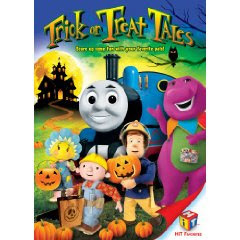 Halloween is almost upon us.. and if your looking for a great kid friendly Halloween dvd for the kids to watch while they sort their candy or to get everyone in the mood I really recommend you run out and buy it this week. I know we'll be watching ours far after the holiday season is over as well. Trick Or Treat Tales is available right now and you can pick yours up on Amazon!